How do I personalize my bear in 'Shop by Occasion'? Once you find the plush animal you wish to order simply click on that animal and move to Step 2 which is selecting the appropriate occasion or sentiment for giving this personalized gift. 800Bear.com offers many preset designs for unique occasions and events. Additional designs are displayed by selecting the down arrow. Select one of the designs you like. 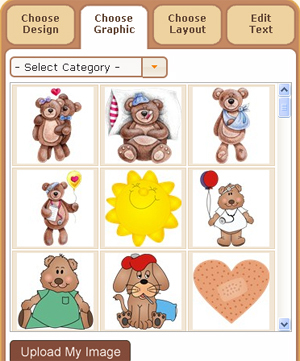 Once you have the design selected it is time to personalize your bear by selecting the 'Customize Your Item' button. Our occasions include the following categories. 800Bear.com offers real time personalization preview of your bear when shopping through the 'Shop by Occasion' section. When your bear first appears it will display our default text and color, now it is your turn to personalize it the way you want it. Select the text line you wish to modify. Once the mouse is inside the text box you will be able to edit the preformated copy to your liking. 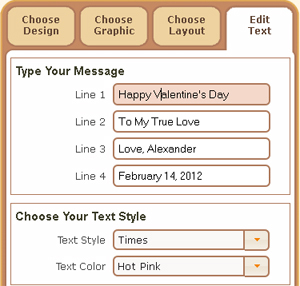 In addition you will have the option to select a different lettering style and text color. Feel free to change this to what looks best to you. All text shown in the preview window will be automatically printed on your personalized bears shirt or bandana depending on the size of the plush animal. Can I change the design graphic? 800Bear.com does provide the ability to change the graphic displayed. After you have selected an initial design you can change out the displayed graphic with another from our library or you can upload your own digital image from your computer. Select the 'Choose Graphic' tab in preview. This will bring up our collection of available graphics. Sort by occasion or sentiment to find the appropriate graphic quickly. Once you have the right image simply click on it and it will automatically appear in your preview display. If you wish to upload your own digital image we recommend following the instructions on the Photo Information page. It provided ample information for making this process smooth and effortless. Yes you can change the layout entirely from our preset design. By selecting the 'Choose Layout' tab 800Bear.com allows you to create your own version. 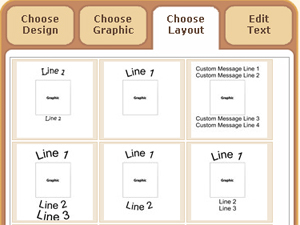 If you select this option you will be required to add your appropriate design graphic, change the personalization and text color. It is important to note that at this time your personalized text does not transfer from layout to layout while in this mode so text will need to be re-entered. What options do I have with embroidery? Currenlty 800Bear.com offers embroidery as shown. We create your embroidered teddy bear as shown with a custom message and or name. The option of changing the lettering style, thread color or position are currently not possible. We are working to add an online personalization preview to our embroidery collection but at this time it is not available. Does the stitching go through the baby blankets? Yes the stitching does go through both sides of the blanket. Due to the nature of stitching a name or message into a blanket the thread will appear on both sides of the blanket.